Susie’s Hope is an inspirational and charming movie that all animal lovers will love and appreciate. Based on the true story of Donna and her rescued Pit Bull named Susie, this movie does a beautiful job at reenacting both their traumatizing and happy experiences throughout their life. I had many emotions while watching the film. At some parts I felt feelings of fear, sadness, and disappointment, while other moments I felt happiness, humor, love and satisfaction. The characters made the movie interesting and enjoyable with their unique personalities. It’s safe to say I fell in love with each one! As a dog lover, Susie’s Hope touched my heart in a special way. The message in the movie is extremely powerful: No matter what negative experiences or fearful events occur in your life, you can forgive, heal and overcome these obstacles. It also proves that if you put your heart and hard work into a goal, anything is possible; just like Donna and Susie’s effort in preventing animal cruelty by passing Susie’s Law. Whether you are an animal activist or not, the overall message behind this movie is magical and life-changing. I enjoyed watching this film and I can’t wait to share it with friends and family. I admire Donna and Susie for their strength, courage and their ability to be inspiring role models to others, especially those who are facing difficult times. I highly recommend this movie to all – it’s a beautiful, heart-warming story that’s worth watching and embracing! This entry was posted in Adoption, Animal Rescue Organizations, Animals Around the World and tagged Pit bulls, Susie's Hope on December 15, 2015 by Rebecca Symon. It’s that time of the year! 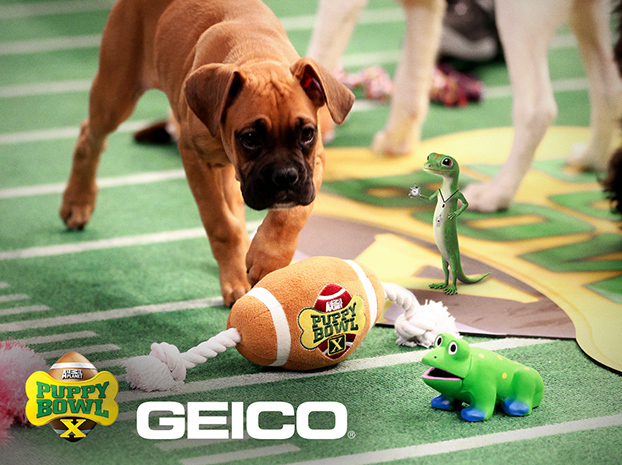 The Puppy Bowl, in its tenth year, will air Feb. 2 at 3pm EST right before the big game on the Animal Planet. Puppy Bowl X will be held in Times Square prior to the Seattle Seahawks and Denver Broncos battling it out in East Rutherford, NJ in Super Bowl XLVIII. The first Puppy Bowl aired in 2005, with only footages of wandering dogs with no commentary and no sponsor ads decorating the stadium with viewership of more than 5.6 million. Ten years later, 12 million people watch this special event. By 2012, Geico brought the naming rights to the stadium and this year they will be introducing a VIP suite, sponsored by Sheba cat food, where cats will hang out. The starting line up consist of 38 shelter puppies. Here are some great photos about the journey to the Puppy Bowl. While one of the Puppy Bowl’s goals is to find homes for rescue dogs, most of this year’s competitors already have a family of their own. This entry was posted in Adoption, Animals Around the World and tagged Geico, Puppy Bowl X, Shebs Cat Food on January 28, 2014 by Belkis Cardona-Rivera.